Learning to be a home herbalist and exploring herbalism within the context of our personal life can open up some truly wonderful experiences. 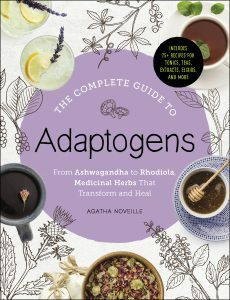 Herbalism at this level is an enriching art that can give us a sense of centering, agency, and profound connection. One of the best things about herbalism is that it allows us to form a deeper relationship with our bodies. There is so much potential within herbalism for us to form a deeper relationship to wellness, nature, and our communities. 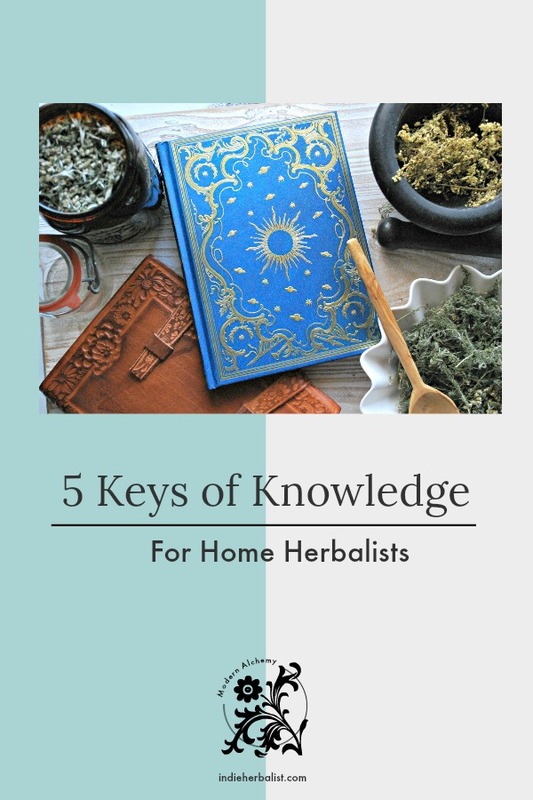 Herbalism itself is built on knowledge, and there are more than a few important things to learn when you begin. 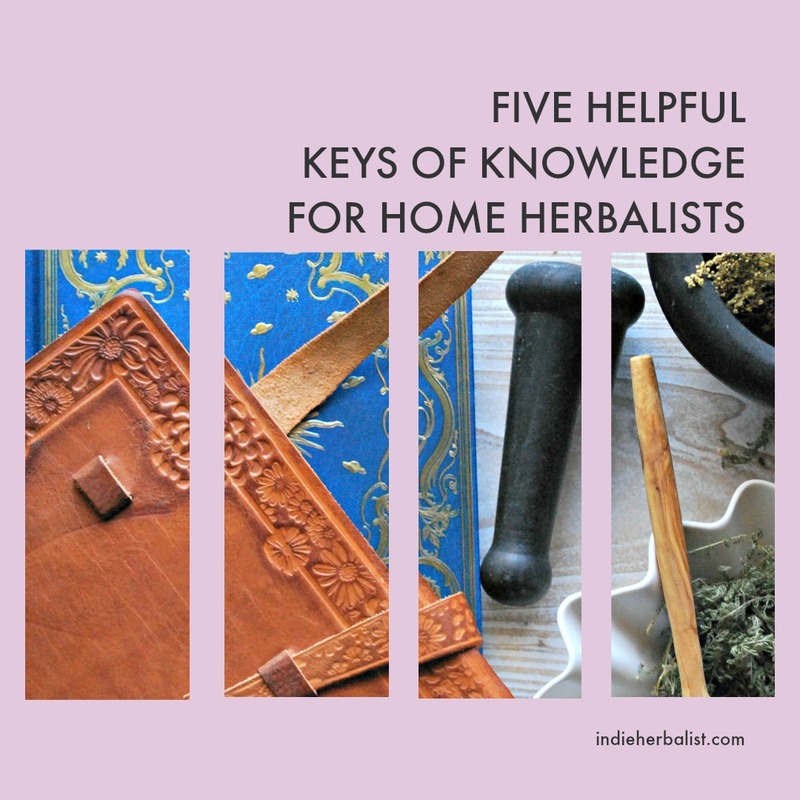 These five keys of knowledge are among the most important for new home herbalists. I hope you will keep these in mind as you create a beautiful herbal life for yourself and your loved ones! It is so important to understand that herbalism is not a regulated profession in the United States. Anyone can call themselves an herbalist. Titles like “Master Herbalist” and “Certified Herbalist” get bantered around a lot – especially online! However, there’s no professional organization that certifies herbalists. Nor is there an accrediting body that oversees professional herbalists or herb schools. This can be both good and bad, but it does mean that all home herbalists need to exercise their good judgement. Skill level, educational backgrounds, depth of knowledge, and critical thinking abilities between herbalists can vary widely. It’s important to determine whether your teachers and resources are detailed, reputable, and ethical. Those things are determined by their experience, educational pursuits, and dedication to serve. Not by whether they call themselves an herbalist. 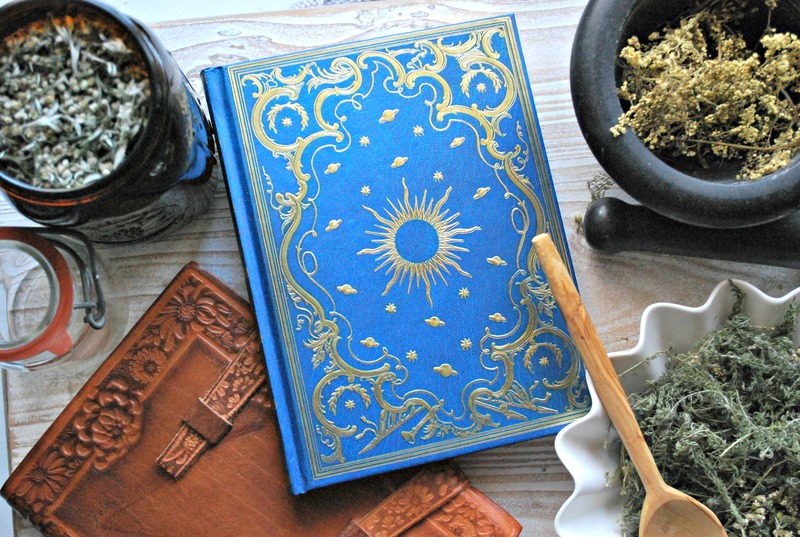 Herbalism itself is a spectrum that runs from folk-traditional through highly scientific. Wherever you happen to have an interest, you can devote your studies and apply them to your life. . . but you can only go as far as your sources. 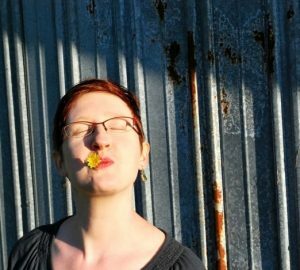 There are many different ways to practice herbalism. On the one hand, you will find folk traditions that go back hundreds or even thousands of years. This includes ethnobotanical traditions of Native peoples as well as Traditional Chinese Medicine and Ayurvedic herbalism of India. Western herbalism has roots in Ancient Greek medicine and the Middle East. 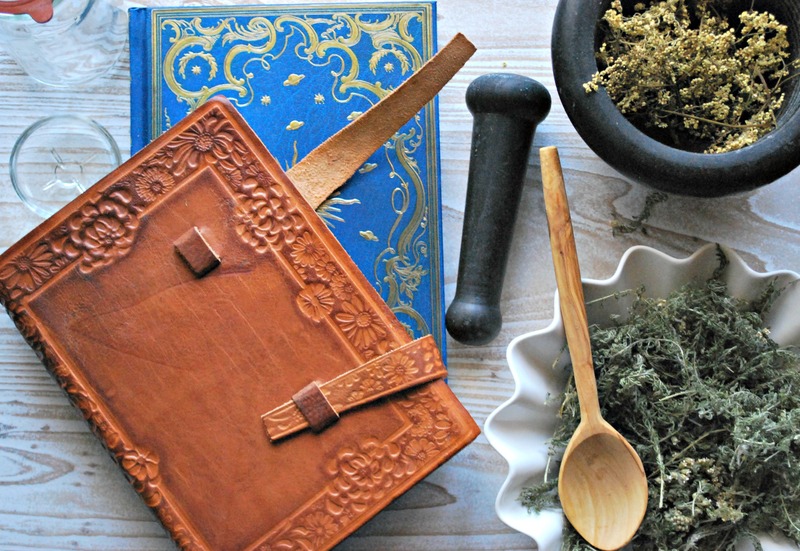 The history of Western herbalism spans from the Middle Ages to the Eclectic physicians of the 1800s and on into modern times. There is also a branch of modern herbalism that focuses on scientific research and phytochemistry in clinical applications. Folk herbal traditions often come with a surprisingly nuanced framework for understanding how herbs and the human body interface. Modern herbal research and a more clinical approach allows you to work with a more precise view of anatomy, physiology, and chemistry. You may find that you prefer one approach over the other, but it’s helpful to learn both sides. They can work surprisingly well side by side, especially as you advocate for your own wellbeing and support your loved ones. Natural also doesn’t necessarily mean good for your child. It can be tempting to think about children as miniature adults, but a child’s metabolism works somewhat differently than an adult’s metabolism. There are also other considerations. For example, you may know that you should avoid giving your child aspirin. Aspirin (acetylsalicylic acid) has been associated with Reye’s syndrome in children and teens and can result in liver and brain damage when given in the presence of a viral illness. Several herbs, including willow, meadowsweet, and poplar, are naturally high in salicin (a precursor to salicylic acid that is converted to salicylic acid by the body). Willow, especially, is not recommended for children under 18. Most likely, I would personally avoid giving meadowsweet and poplar as well. On a related note, herbs can be just as supportive of our pets and livestock as they are for us. However, their metabolisms work differently than ours, and because of that you need to remember that not all human-safe herbs are safe for your feathered and furred. There may be differences in dose, too – the same ratio of herb per pound of body weight that works for a human may not be the right amount for an animal. Also, be careful of generalizing between species. A dog’s metabolism is different from a cat’s, and both are different than a human’s. A great example of this is the way our bodies respond to garlic. Garlic contains thiosulfate, large amounts of which can cause hemolytic anemia in dogs. It generally takes a large amount of garlic to harm a dog, but sensitivity can vary between breeds and among individuals. So if you don’t know whether an herb is ok to share with your pets, be sure to research the herb and talk to a veterinarian. (If you’re interested, here’s a longer article about dogs and garlic from another herbalist’s perspective). 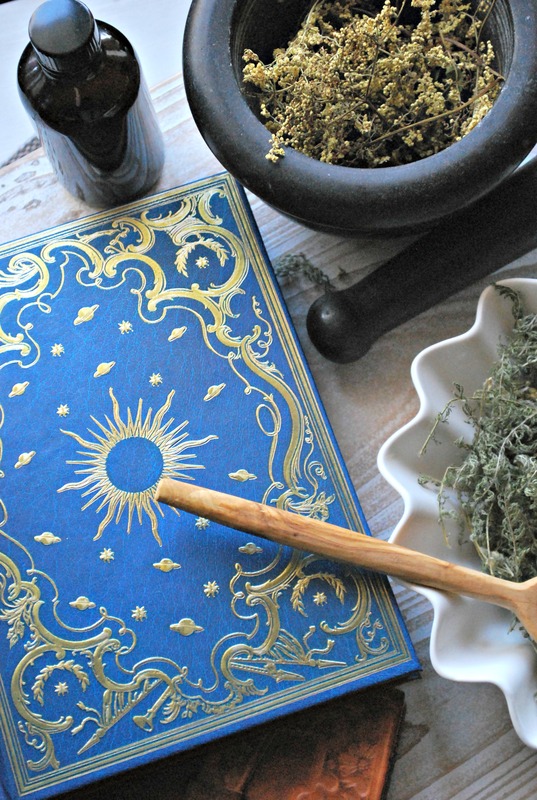 Working with herbs in our own lives often inspires us to share our new wisdom with others. It’s easy to get caught up in excitement as you experience herbs for yourself and want to share what you’re learning. However, you need to be careful with how you share what you know- specifically, the words you use to describe your new knowledge! It can be tempting to use words like “cure” and “treat”. This is a very common error among new herbalists, and one you should try to avoid from the beginning. It’s better to start the right way than deal with the frustration of retraining yourself later! Let’s look at the short and sweet version of this. Essentially, you should never make claims about an herb that make it sound like a drug and you should never try to diagnose or treat a medical condition. So words like “cure” and “treat” are off-limits. This includes saying that an herb can relieve specific symptoms. Please understand that this is a very serious issue and not simply a matter of semantics. If you go on to do lifestyle consulting or work with clients as an herbalist, using medical language could lead to charges that you are practicing medicine without a license. Depending on the circumstances, this could be charged as a misdemeanor or a felony and you could potentially face fines and even jail time. Pretty serious stuff! Granted, it can be really confusing at first. The legal definition of practicing medicine without a license can vary from state to state. The language you can and can’t use may, therefore, vary from state to state. To start, learn your state’s definition and be particularly aware of “reserved” terms – words that indicate the practice of medicine and are reserved for licensed medical practitioners. Instead, learn to share information about herbs in other ways. Discuss them in terms of traditional use, and cite modern research studies that show potential benefits. Also, try keeping things personal. It’s generally fine to say things like “When I have a cold, these are the herbs I use and why.” It’s not ok to say things like “This herb will cure your cold”. Knowing the best language to use is simply a good idea. Even for home herbalists! Nobody likes to hear this, but very poisonous plants do exist. Learning the art of foraging and wild crafting can be exciting. It’s best to find an herbalist in your area who can show you what’s what. Take the time to learn botany so you can key plants out, too – glancing at a field guide isn’t enough for most people. Plants can look deceptively similar until you learn the tricks of the trade! There are also ways to use generally safe plants in dangerous ways. Like refusing to go to the doctor when you really should. Or using too much of an herb or taking it too frequently. Or mixing with pharmaceuticals or OTC medications without understanding how the herb could potentially interact with medications. In the right settings and in the right amounts, herbs can be valuable allies. They help us create our best health. But we need to approach them with respect and knowledge.